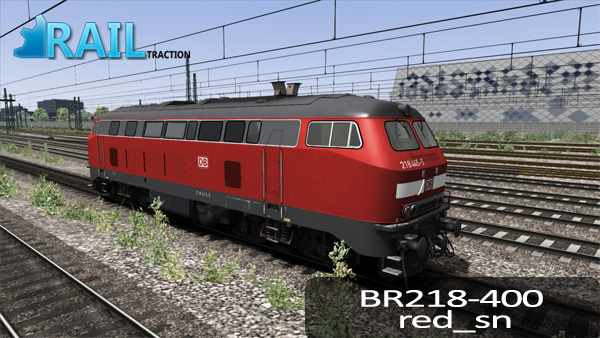 Welcome by the RailTraction online Readme of the add-on BR 218-400. In the 50s of the last century, Deutsche Bahn (DB) planned a single-engine, four axles diesellocomotive with two cabines to purchase. At the time, the V160 was de largest dieselengine family in various variants: the Baureihe 216. After further development, the the Class 218 was the result. 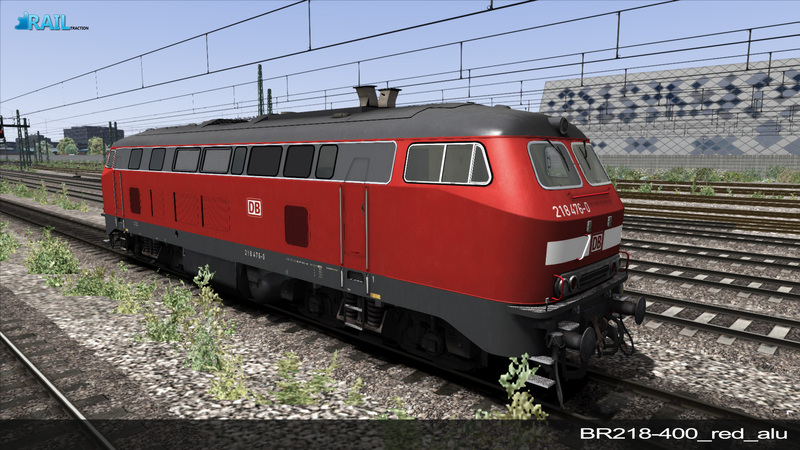 The Class 218 of the Deutsche Bundesbahn (DB) is a een serie of four-axle diesellocomotives originated from the already known V 160 and Class 216 with a length of more then 16 metres. This Class is tested for many years. After this period, the serie was build between 1971 and 1979. In total, 398 engines were build. The machines were first fitted with MAN-motors with a power of 1.840 (2.500 HP) and a weight of 78 ton. Later series of the Class 218 were fitted with MAN 12 V 956 TB 11 motors or the well known Pielstick 16 PA 4V 200 motors. So the Class 218 can be split out in many different variants. This package contains the Class 218-4. For many years, the Class 218 is the most importent representative of West German diesellocomotives for main lines. The engines were mostly based around the areas of Schleswig-Holstein, Braunschweig, Pfalz, Oberpfalz and Bayerisch Woods. Today, the Class can be find on non-electrical lines of the DB were the locomotives pulls fast passenger services, semi-fast passenger services and even freighttrains. Examples of routes were the Class 218 can be seen now is Munich - Bregenz (Austria) and Hamburg - Lubeck. The Class 218-400 has a maximum speed of 140 kilometer pro hour and a weight of 80 ton. Standard traffic red with gummi window framework. Standard traffic red with aluminum window framework. Standard traffic red with snowplough. Standard traffic red with aluminum window framework and snowplough. 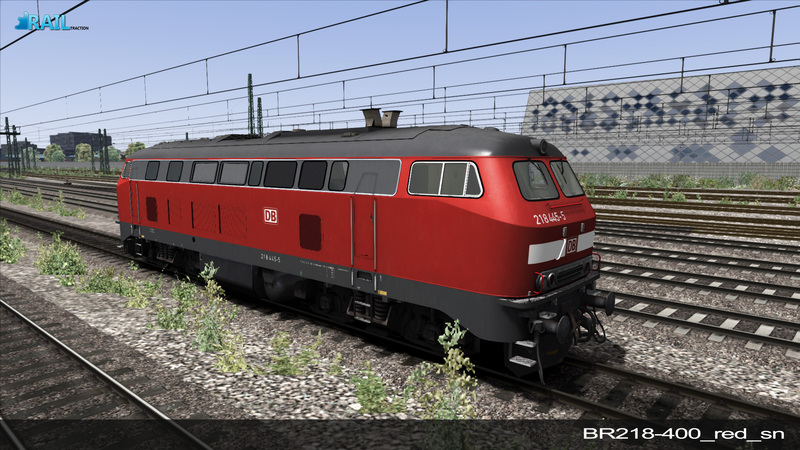 This add-on contains the German diesellocomotive Baureihe 218. If you need to brake, you need to decrease the pressure by using position three. The brakes will apply. In position 2, the airpressure is stable so the engine brakes continously brake the same percentage. When you want to stop braking, you use position 1. The compressor increases the airpressure in the brake so the brakes are released. Position 1 is the standard position of the airbrake, the brakes are now released. Position 2 is minimal brakepressure. Position 3 is decrease pressure. Position 4 is the emergency brake. Full brakepower will be applied. The dynamic brake is a hydrodynamic brake ("retarder"), whose range depends on the setting for the fast passenger or slower freight gear (see below): The fast gear (=Schnellgang) in passenger transports, the dynamic brake can be used up to 45 km/h. The gear of goods in the slow gear (=Langsamgang) only up to 20 km/h. The dynamic brake supports the air brake (train brake) during a braking operation, but it can also be used independently inside the above specified speed ranges. The engine contains two modes: passenger (Schnellgang) and goods (Langsamgang). The differences are maximumspeed and tractioneffort, respectively lower and higher. Standard, Schnellgang modus is on. To change the modus, the engine need to stand still with the motor shut off. 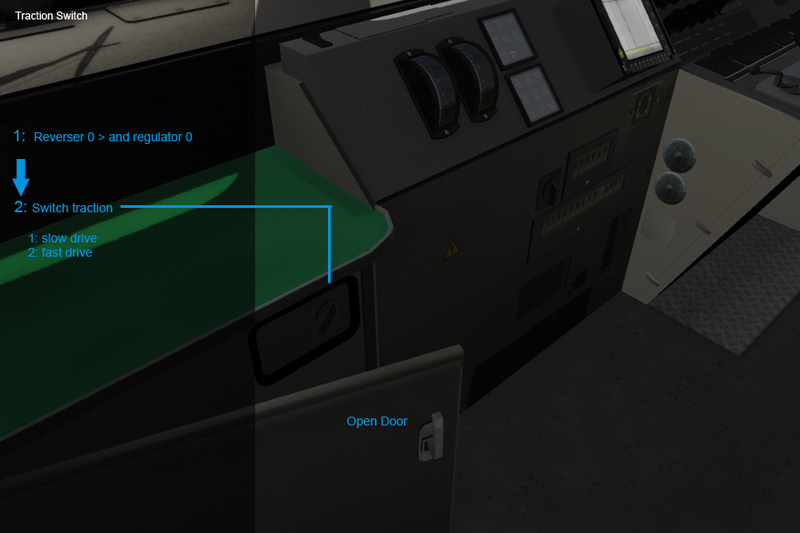 In the cab you will find on the left side of your chair a door. This door can be opened and you will see a fault lamp and turnbutton. The turnbutton stands nog to Schnellgang. Turn around this turnbutton to Langsamgang and the locomotive is available for freight (or goods). Motor start of the BR 218. 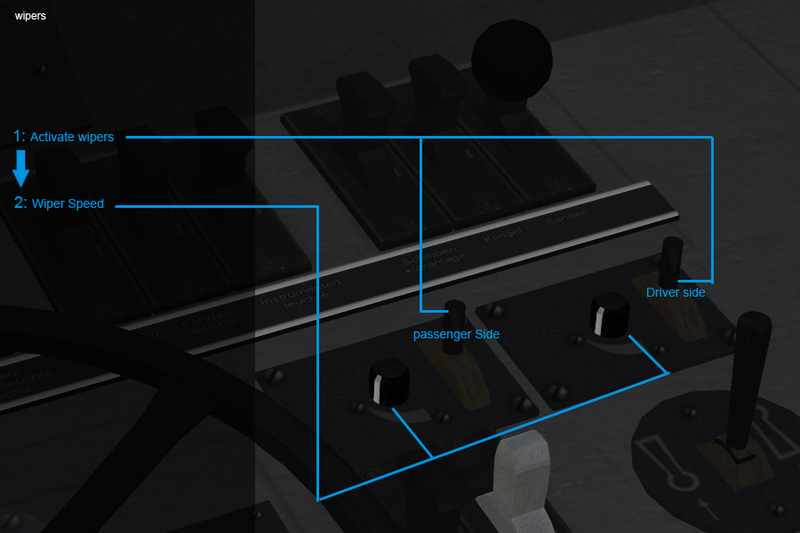 Please note: in normal situations, you take over the engine with the engine already started. 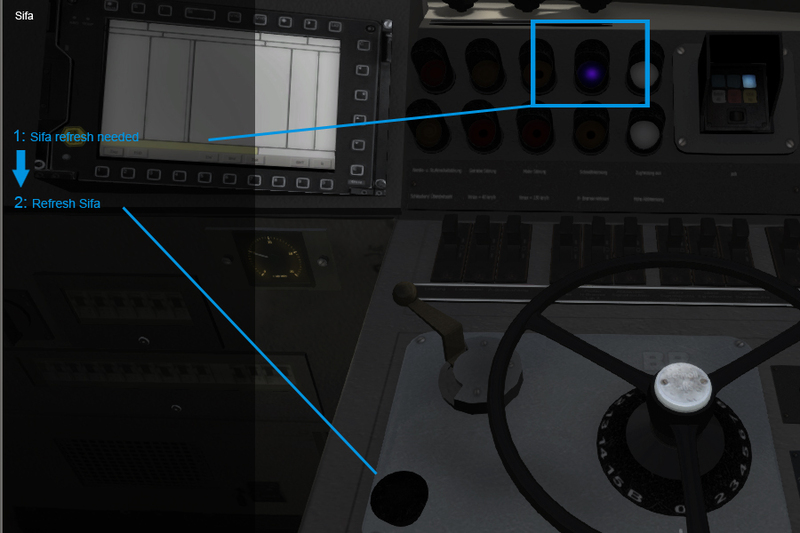 Shut down the engine is possible by turning the button to the left (below). You can change the gear mode behind the door in the cab on the left of the driver position. Open the door and you can switch between the two gear modes. Please note: the gear is normally switched in the fast drive position for passengertrains (Schnellgang). Overview of the most functions of the BR218. 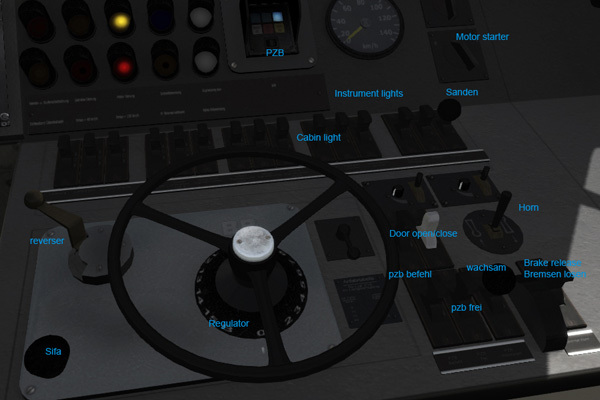 Overview of the functions on the left side of the driver position in the cab of the BR218. 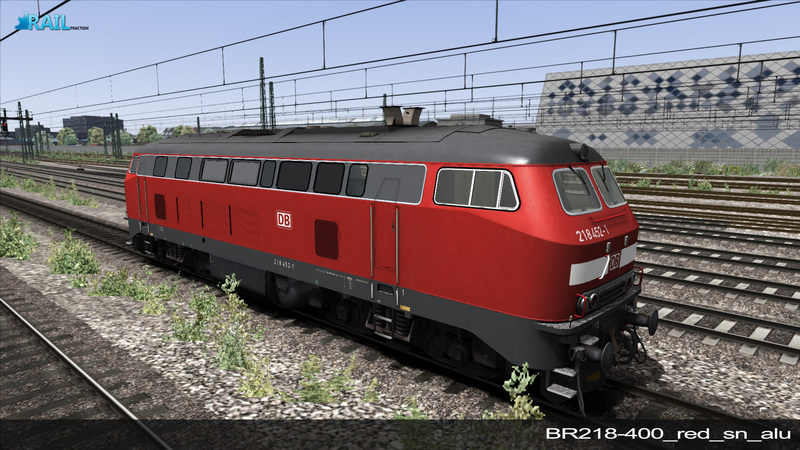 Wipers of the BR218 can be set independendly. Switch them on or off and choose the interval. When you receive a 2000hz signal, the emergency brake apllies. 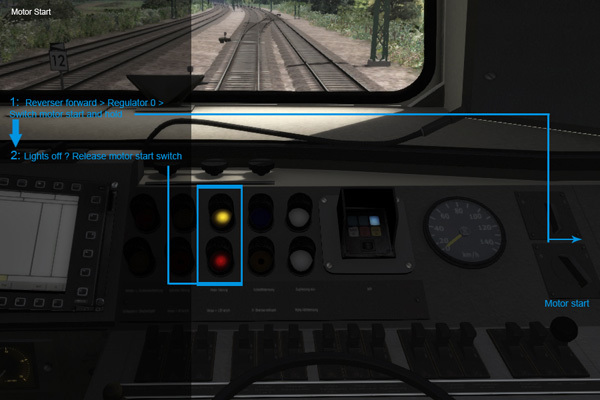 When your speed is zero, you can release the brakes by releasing PZB and moving the train brake up and down. 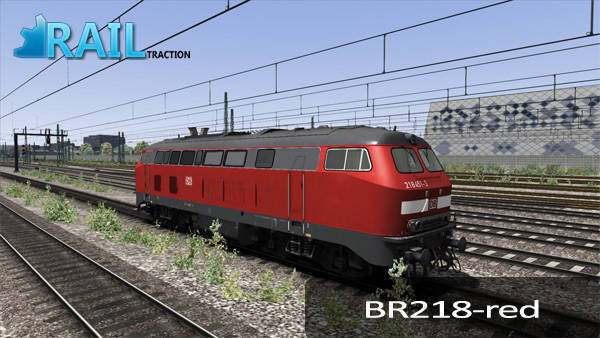 The add-on BR 218-400 contains two Free Roam Scenarios for the Munich Augsburg Route and Ruhr Sieg Line. 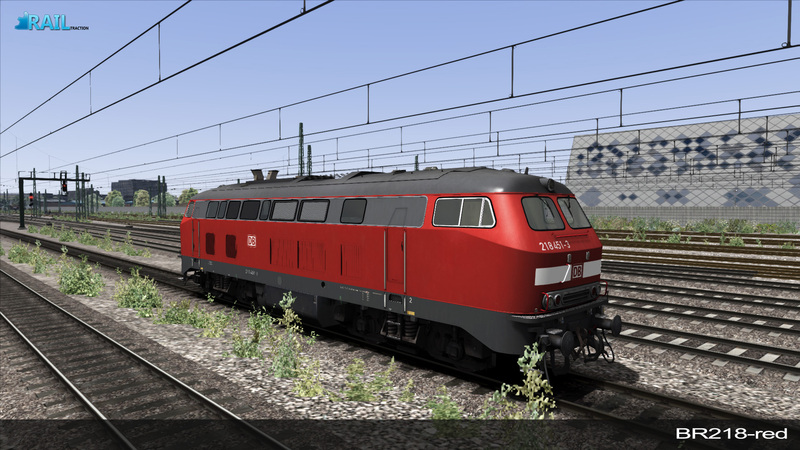 Please note: You will need to have had Train Simulator 2012 or the add-on Ruhr Sieg Line from Steam in order to play the scenario for the Ruhr Sieg Line. 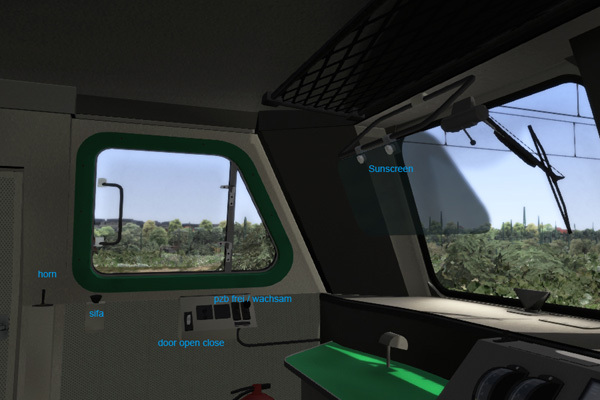 The scenario for the Munich Augsburg Route needs Train Simulator 2013 in combination with the route Munich to Augsburg. 8. 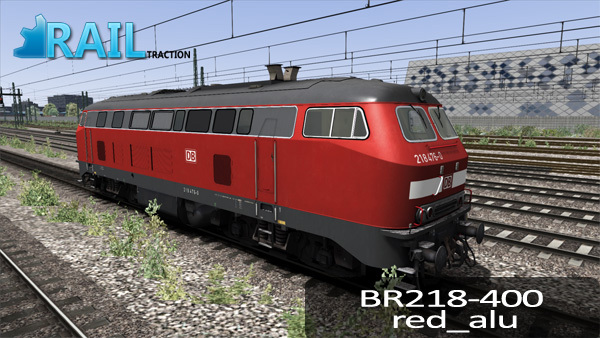 Check on the name of the add-on (if not already checked), treinen. Now you will find the locomotive in the tab trains named BR218. 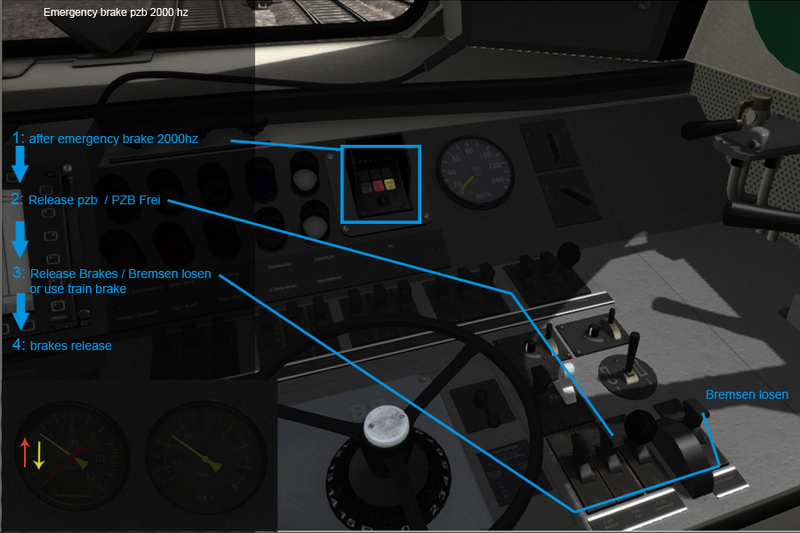 You can set your own locomotivenumber in the World Editor. Please double click on the engine on the track. Open the tab on the right side of the screen and you will see some numbers. These numbers corresponds with the locomotivenumber. An example of the trainnumer is 218400-9. You may change the number in everything you want. 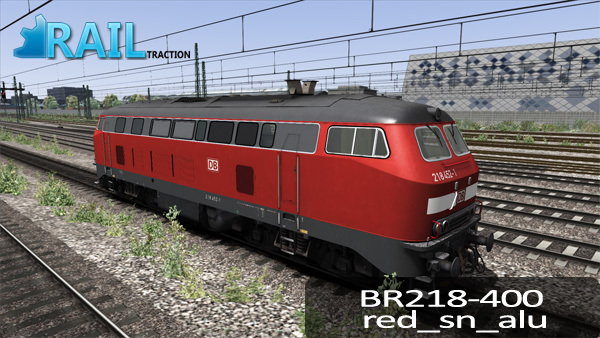 Its not possible to make reskins of the add-on BR 218-400.